In a large bowl, toss fish cubes with oil, and season with salt and pepper. Wrap a bacon strip around each cube and skewer, using the skewer to secure the bacon. Thread only 4 to 5 fish pieces onto each skewer. Heat outdoor grill or indoor grill pan to medium-high heat. 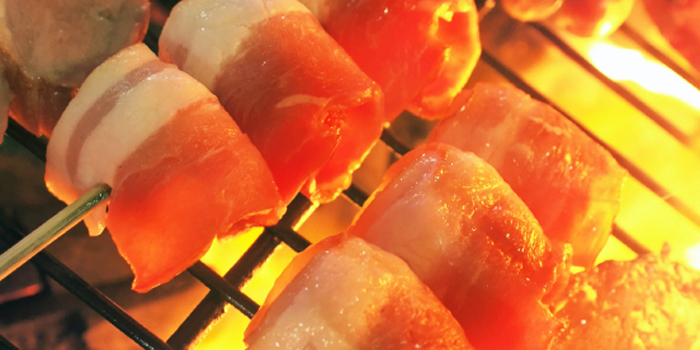 Cool skewers, turning once, for about 8 to 10 minutes or until bacon is crisp and fish is opaque and cooked through. Serve immediately with lemon wedges. Note: If you are using bamboo skewers on an outdoor grill, soak them in water for about 15 minutes before skewering on the fish. This recipe by Charlotte Fekete first appeared in the July 2008 issue of Our State.